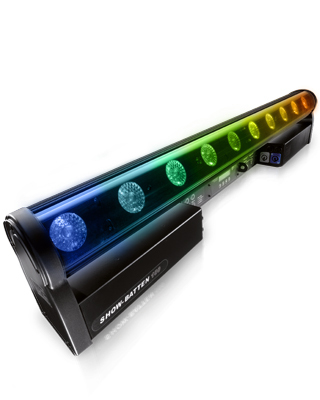 The Show Batten 100 is a LED moving bar designed for stage lighting professionals. Ten high-power Osram Ostar RGBW LEDs are housed inside a 100 cm long (39”) cylindrical aluminium bar. Each parameter of each LED may be controlled individually: color, 16 bit dimmer and 24 Hz strobe. The Show Batten lens is fitted with a wide electronic linear zoom. The “Show Batten AS” version has a special ovalizer filter instead of the standard lens, which increases the projection angle on a single axis. This is particularly suitable for wall washing. The zoom is very fast: 0.3 s from min. to max. The colors are generated through R, G, B and W channels, and may also be chosen from a wide palette consisting of over sixty macros. The color temperature can be linearly adjusted from 2500 K to 8000 K thanks to control through a dedicated CTO channel. The Show Batten has a 240° tilt and can rotate very smoothly and very fast (240° in as little as 0.2 s). It is compact, rugged and lightweight: only 9 kg (19.8 lbs). Several bars may be arranged in a line or a matrix, with a constant fixed distance between the LEDs. An internal Ethernet switch for IN/OUT daisy-chain connection makes it easy to connect the bars up for pixel control in a matrix arrangement.